These earrings are Authentic Native American made with high quality Delica seed beads in a Cherokee brick stitch pattern with strong nymo bead thread. The total measurement is 3 ½ inches long. These earrings have silver plated French Hooks for pierced ears. 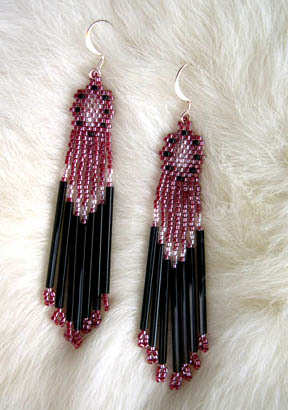 Can be made in any two colors you choose to go with the black bugle beads.